Part of the getting ready process is deciding how much info to share (or not share) with my children ahead of time about what they might expect in Africa. There is a fine line between preparing them and scaring them. 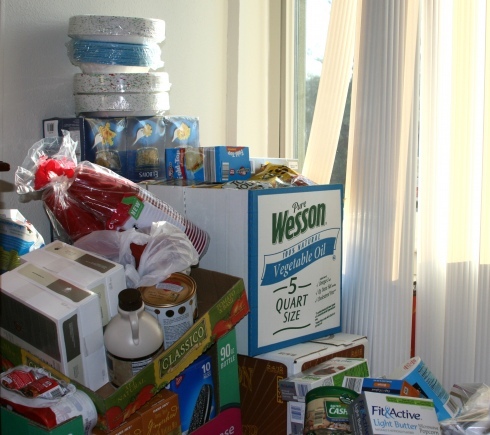 The photo above is from a different expat’s family and some of the food items they packed for their move. 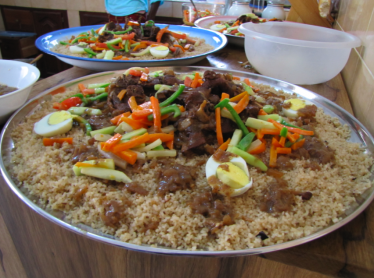 The photo below is a traditional Senegalese meal that is eaten with your right hand. Now I expect that our reality will live somewhere in between the two photos. There will be things that we pack for the move, including food or household items that will just make things easier for everyone (One child could live on instant oatmeal). I also expect that we will have many opportunities to eat traditional Senegalese meals. I’m guessing that silverwear can be used if that is the comfort level for the kids (or us). I don’t feel the need to replicate the exact eating or grocery experience for my family while we are there. That is one of many things I am looking forward to as being able to experience a different culture. I am taking the opportunity when things come up in regular conversation to make connections for them. On the other hand, I don’t like it when people word their comments to me in a way that implies that the children and I should be terribly frightened. I’m sure they aren’t thinking about it that way, but it does honk me off a little. The View From Here (an Ohio missionary couple in rural Senegal) is also one I check frequently. I know that there isn’t anything that is going to be able to completely prepare all of us for this move, but it IS going to be a positive experience for all and we are going to learn a ton that we would not be able to learn by moving to Indiana or even London. It’s okay if the idea of moving to West Africa is completely beyond your wild imagination. Everyone has different comfort levels. We aren’t scared. We are excited and know that there are going to be highs and lows along the way, but so would there even if we never set a foot outside of Granville. Reading is Fundamental has a great new article about “Summer Slide” (not the fun one). Those who DON’T read over the summer lose reading skills. There is no option of doing nothing and having nothing happen. Not choosing, is a choice with consequences in this situation! I just arrived home from Book Club and received the update about bedtime from my husband. We both had to laugh about the following story that took place while I was gone. So we are not quite sure what is most amusing, the fact that she referred to herself in third person or that she used the word “literature”. Either way it is classic and I take it as a huge compliment. The same daughter did not want me to go to Book Club tonight and was pretty sure that I should let her come so she could hear grown-ups talk about books. She has also decided that she should be allowed to have her own blog to review books. She declared that if I am going to read 100 books for a challenge, that she certainly will as well. Amusing, but also endearing. This same child is the one I’ve written about in the past. The struggle to get her hooked reading a book in the past has been a sore spot for me. Fortunately we seem to have moved past that hurdle. It’s certainly the nicest thing I’ve heard so far this week. Griefwatch has a website that goes along with the book Tear Soup. It is definitely worth checking out. A video for Tear Soup was also just released.